Idé-eolaíocht agus fealsúnacht pholaitiúil is ea an cumannachas. Saghas sóisialachais atá ann agus é dírithe ar an gcóras caipitlíoch a chur de dhroim an tsaoil le réabhlóid fhoréigneach, murab ionann agus an sóisialachas daonlathach, atá ag iarraidh sochaí chothrom a thabhairt isteach trí leasuithe síochánta daonlathacha a chuirtear i gcrích de réir rialacha an pharlaiminteachais. Is é an tuiscint atá ag lucht leanúna an chumannachais ar an scéal, áfach, ná go bhfuil forás agus dul chun cinn na sochaí bunaithe ar chogadh na n-aicmí sóisialta, agus gur dual don chogadh seo dul chun géire de réir mar atá an réabhlóid ag druidim isteach linn. An sóisialaí daonlathach atá ag iarraidh saol níos fearr a chinntiú don lucht oibre trí chomhchainteanna leis an lucht rachmais, níl ach meas an fhealltóra aicme ag an gcumannaí air, nó níl sé ach ag coinneáil siar na réabhlóide a thiocfaidh chomh cinnte agus atá an Cháisc ar an Domhnach. Is é is mó a bhíonn i gceist leis an téarma "cumannachas" ná an leagan sin den sóisialachas a d'fhorbair Karl Marx, i dteannta le Friedrich Engels, sa naoú haois déag, agus na gluaiseachtaí agus córais pholaitiúla a leanann teoiricí Mharx. 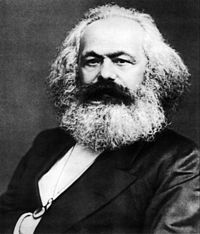 Bhí Marx go mór faoi anáil Hegel, agus chum sé teoiric chuimsitheach faoi fhorbairt stairiúil an chine dhaonna, ar thug sé "coincheap ábharach na staire" uirthi. De réir na teoirice seo, b'é coimhlint na n-aicmí geilleagracha inneall na forbartha stairiúla ar fad. In aimsir an chaipitleachais, d'amharc Marx ar an lucht oibre díomhaoin dúshaothraithe - an phrólatáireacht - mar oidhrí an domhain; dar leis, b'é an caipitleachas a chruthaigh an aicme seo agus mar thoradh ar phróisis inmheánacha an chaipitleachais féin - is é sin, de thoradh na forbartha a bhí tosaithe ag an gcaipitleachas féin - d'iompódh aicme an lucht oibre ina fórsa réabhlóideach a chuirfeadh deireadh leis an gcaipitleachas le córas nua sóisialach a bhunú ina áit. Cuid lárnach de theagasc an chumannachais is ea an cinnteachas stairiúil. Is é sin, creideann an cumannaí go bhfuil stáisiúin na staire léarscáilithe cheana féin. Roimh an gcaipitleachas, bhí an feodachas; i ndiaidh an chaipitleachais, tiocfaidh an sóisialachas, agus ní bheidh sa sóisialachas féin ach céim idirmheánach roimh an gCumannachas, an todhchaí Útóipeach, ina mbeidh caidreamh na ndaoine chomh sibhialta, chomh nádúrtha agus nach mbeidh gá leis an stát féin a thuilleadh. Go praiticiúil, ní raibh na páirtithe cumannacha ábalta an Útóipe chumannach a bhaint amach in aon tír ina raibh siad ag rialú. Na tíortha inar tharla réabhlóid chumannach, chuaigh siad in abar sa "sóisialachas idirmheánach", agus an córas polaitiúil ag dul ó mhaith ar fad le deachtóireacht, géarchéim eacnamaíochta, breabaireacht, míleatachas agus mionghadaíocht. Is iad na campaí géibhinn is mó a shamhlaítear leis an Aontas Sóivéadach inniu, nó níor tháinig tuar riamh ar thairngreachtaí na luath-chumannaithe faoi shaoirse na hÚtóipe - a mhalairt ar fad. Ón taobh eile de, bhí páirtithe cumannacha in ann leas na ndaoine bochta a chur chun cinn ina lán tíortha Iartharacha ina raibh siad sásta rialacha an daonlathais a urramú - rud a bhréagnaigh teoiricí an chumannachais féin. Bhí réimse leathan de eagraíochtaí polaitiúla de chuid an lucht oibre ag fás anuas in Eoraip na naoú haoise déag, agus idé-eolaíochtaí sóisialacha agus ainrialacha forleathan ina measc. Ghlac cuid mhaith den ghluaiseacht sin le teoiricí Mharx. Nuair a tháinig an Chéad Idirnáisiúntán agus an Dara hIdirnáisiúntán chun saoil, d'iompaigh páirtithe na gluaiseachta sóisialaí ina bhfórsa cumhachtach ar fud thíortha tionsclaithe na hEorpa. Ach b'é an Chéad Chogadh Domhanda a chuir tús leis an gCumannachas mar chóras rialtais. Nuair a thit an tóin as Impireacht na Rúise, bhí na Marxaigh in eite Bhoilséiveach an Pháirtí Sóisialaigh Dhaonlathaigh, faoi cheannas Vlaidímír Léinín, in inmhe seilbh a ghlacadh ar an tír. D'fhéach an Ghluaiseacht Spartacach, nó an Spartakusbund, le réabhlóid shóisialach a chur i gcrích sa Ghearmáin ag deireadh an chogaidh freisin, ach theip uirthi go gasta. Sa bhliain 1919 bhí rialtas Cumannach faoi Béla Kun ag obair ar feadh tamaill san Ungáir. Níor mhair na Cumannaigh i gceannas ar aon tír eile seachas an Rúis, nó Aontas na bPoblachtaí Sóisialacha Sóivéadacha. Níor éirigh leis an Aontas Sóivéadach féin an Útóipe Chumannach a chur ar bun a bhí geallta ag Marx i ndiaidh thréimhse idirmheánach an tSóisialachais. Seo iad na tíortha a bhfuil rialtais Chumannacha i gceannas orthu i láthair na huaire. Tugtar ainm an pháirtí atá i bhfeidhm idir lúibíní. Ar ndóigh, ní córas ná sochaí Chumannach atá i gceist mar a thuig Marx an focal, ach córas "idirmheánach" Sóisialach. Tugadh an leathanach seo cothrom le dáta an 20 Feabhra 2019 ag 23:12.